Swap out hash browns for tater tots in this cheesy breakfast dish. Tots are covered with ham or Canadian bacon, green onions and eggs. To hold it all together, Wisconsin provolone is sprinkled on top. Grill or fry ham; set aside. Cook eggs to order (fried, scrambled or poached), leaving them slightly underdone. 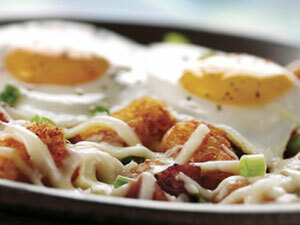 Add tater tots, ham and half the green onions to 6-inch cast iron skillet; top with prepared eggs; sprinkle with cheese. Place skillet under salamander or broiler to melt cheese; garnish with remaining green onions.